I absolutely adore the movie Tangled. Not only is it an all around sweet movie, but it has a big white horse that acts strangely like my own horse, but it also has an outlaw-turned-good-guy in it. I’m a sucker for those stories. Whether it is Flynn Rider in Tangled or Killian Jones/Captain Hook in Once Upon a Time, the outlaws with a soft heart get me every time. 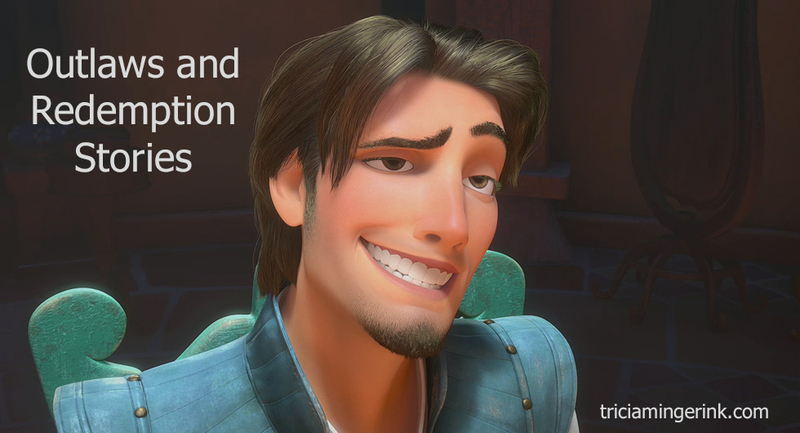 But I can’t blame my obsession with this type of character on Flynn Rider or Killian Jones. I don’t even blame Disney’s Beauty and the Beast, even though that was my favorite Disney movie growing up. Nope, I blame Renn Frayne. Tall, dark, handsome. Steps into a bad situation and saves the girl and her land while also being stuck in a crazy love triangle. Never heard of him? Well, you must not read Zane Grey Westerns. Zane Grey was an American writer who wrote a number of adventure stories and Westerns in the early 1900’s. Yes, the writing is early 1900’s style and the descriptions can sometimes drag on for pages. I started reading Zane Grey in my teens, and my first Zane Grey was Knights of the Range. Holly Ripple is left alone on her ranch when her father dies. Before he died, her father gathered a group of loyal cowboys and dubbed them Holly’s Knights of the Range. When the ranch is in danger, the outlaw Renn Frayne accidentally saves Holly and reluctantly joins the fight to save Holly and her ranch. I might have had a little crush on Renn Frayne in my teens. 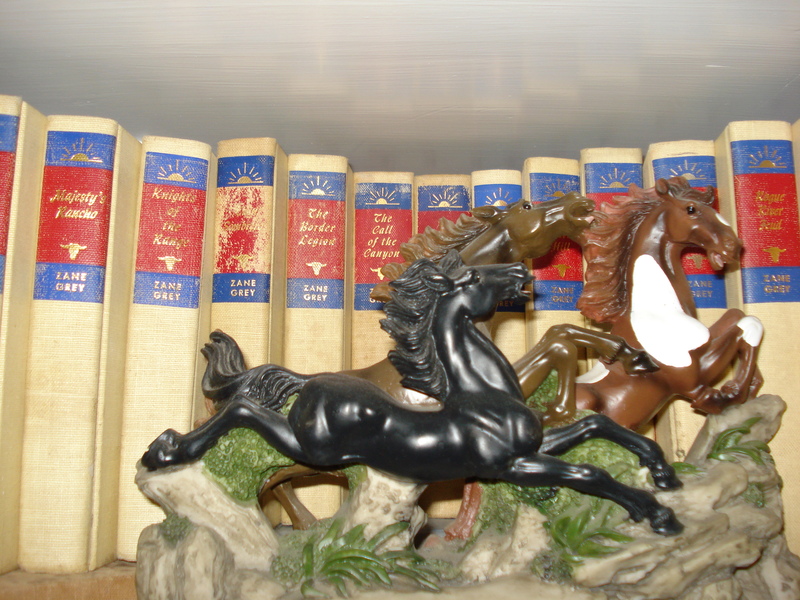 A shelfie of one of my shelves of Zane Grey books. Knights of the Range is second from the left. Twin Sombreros, its sequel, is the scuffed cover next to it. Why am I drawn to the outlaw-turned-good-guy so much? Perhaps it is the depth of the struggle that these characters face. Maybe it is the reminder that, as a Christian, my story is a redemption story. It’s probably no surprise that my upcoming release Dare features a conflicted assassin. What about you? Are you drawn to outlaws-turned-heroes? Is that a real question? lol! Yes. Every time. And I’m not ashamed. 😛 And I already have a soft spot for that conflicted assassin you mentioned…. Oh, yes, I do love my “bad” guy turned good guy. I have one in my WIP as well…well, kind of. 🙂 I’ve heard of Zane Grey, but I’ve never read any of his books. Perhaps that will have to change. I LOVE the outlaw turned hero and a good redemptive story, too!!! #LT As a Christian author, I think it’s good to show flawed characters who come to grips with their own wretched state and fall into the arms of grace. And when the character just so happens to be a good-looking guy who might just be absolutely perfect for the girl, it makes for an awesome story!